In theory, giving kids household chores seems like a winning scenario for everyone involved — kids gain responsibility and parents finally get some extra help with the dishes, the dog and the never-ending piles of laundry. Kids aren’t always willing participants in this well-conceived plan. All too often, parents find that getting a child to finish a job proves to be more work than the actual chore itself — and they grudgingly pick up the slack themselves. 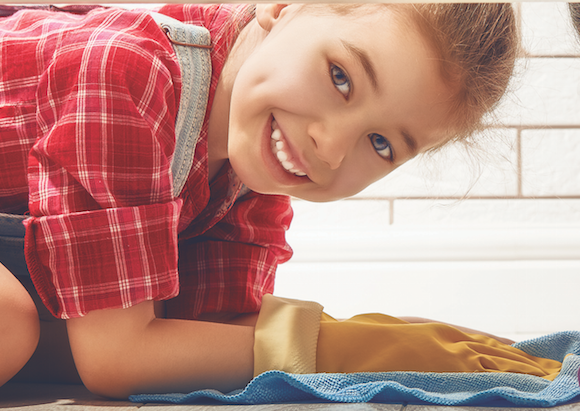 That means today’s kids are doing less around the house: according to the University of Maryland Population Research Center, kids’ time spent doing housework dropped 25 percent from 1981 to 2003, and kids ages 6-12 now help out for just 24 minutes per day. Letting kids off the hook can seem like the easy way out, but it’s a mistake, says Judy H. Wright, parent educator and author of “77 Ways to Get Your Kids to Help At Home.” Household chores breed confidence, competence and success. If you could use a little more help around the house, read on for ways to get kids to pitch in, from the pokiest preschooler to the most petulant pre-teen. Parents often aren’t sure whether tots can or should do household chores, says child development specialist Uschi Wells of Imprints, a parent education organization in Winston-Salem, N.C. Household chores can be a developmental boon to young kids. Young kids often enjoy helping their parents, making early childhood an excellent time to start with a few small chores, Wells says. The key to soliciting cooperation from young children is to make it fun, she notes. This isn’t the time to pile on the pressure by assigning too many jobs or nagging; instead, find jobs a young child enjoys, like dusting baseboards, sorting laundry, or unloading silverware from the dishwasher. The late elementary years are a time of social and emotional growth, and children become more concerned with independence than with pleasing their parents — so the sweet child who used to cheerfully sort socks and make her bed may start to shirk the simplest household task. The spurt of physical growth and hormonal changes toward the end of elementary school leaves kids justifiably tired at the end of the day. Tweens should still help, but parents may need to enlist a little creativity to get them off the couch. Wright recommends giving jobs with a time limit attached: a child must feed the dog before he eats dinner, for example. Take on bigger jobs like bedroom cleaning on Saturday mornings before the weekend rush begins with a regular one-hour “work party” (complete with tween-approved tunes). Between 7 a.m. classes, after-school jobs and burgeoning homework loads, it may seem like teens are too busy for chores; they’re either constantly on the go or sleeping. During the busy teenage years, some parents relax rules about household chores to allow teens to focus on schoolwork. That’s fine, says Wright, but the teens still benefit from contributing to the household.